Analytics is the process of uncovering meaningful patterns in data and using that information to guide decision-making. Using the plethora of data available to school districts and states, we now have the ability to turn data into actionable information to improve student learning. VARC works with school districts, states, and non-profits to use this data in innovative ways. 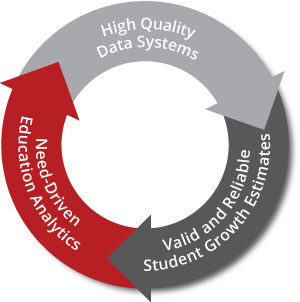 Value-Added and Student Growth Measures: VARC applies analytics to education data to develop and implement student growth measures—particularly value-added. We have been doing this work with school districts and states since 2005. Education Analytics: Our work goes beyond student growth measures. Analytics can help educators set attainable yet aspirational student achievement goals, or allow schools to identify students early on who may need extra help making it to graduation. VARC has developed these and other types of metrics for many of our partners. Data Systems: Analytics then drives, by necessity, the continuous improvement of data systems. VARC consults with partners around improving data systems to support advanced analytics.